This slender movement requires absolutely flawless construction and all the skill of the master watchmaker who assembles and polishes it with painstaking care. Cased in gold, platinum or steel - individually numbered and signed - only a few hundred ultra-slim watches leave Blancpain's workshops every year, to be handed down as precious heirlooms from one generation to another. Blancpain has perfected and miniaturised this masterpiece of the watchmaking art. Its power reserve eliminates the necessity of daily winding and guarantees optimum precision due to the slower more regular detent of its barrel spring. Today, as in 1801, the Tourbillon represents one of traditional watchmaking's masterpieces. 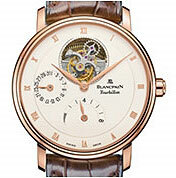 Paying tribute to this exceptional invention, Blancpain presents Tourbillon watches water-resistant to 30-100 meters. Blancpain's self-winding chronographs are among the smallest and the slimmest chronograph movements in the world owing to a totally new construction concept: The coupling-clutch wheel also functions as a brake; no additional coupling wheel or blocker is required. And only one finger drives the minute and hour counter. The ultra-slim sums up the essence of mechanical horology. Its earliest plans go back to 1911, ending in perfection just in time for the year 2000. Blancpain then issued a half-hunter version, warmly received by everyone with an eye for time at its best. One year later, Blancpain's watchmakers jumped at the opportunity of placing this breathtaking design on a woman's wrist, particularly one with a taste for exceptional objects.